The probate of Mary J. Barclay Ford was obtained at the Connecticut State Library. I visited that library in 2011. It was my second time visiting that archive. I had to order the estate file special and they had me come in and sit in the special collections area of the library. Will of Mary J. Ford, July 18, 1904, Bristol, Connecticut, Accepted 10, April, 1917, Vol. 42 pg. 410 , Attorney Epaphroditus Peck, Witnesses Frank L. Muzzy and James T. Mather, Jr. Witness Affidavit, July 18, 1904. Affidavit Concerning the Payment of Taxes on Choses in Action and Other Property – $1750 for Real Estate and $500 for Machinery and $25.00 for one horse. Application for Probate of Will, Filed in Court 3rd April, 1917 Rec. Vol. 39, Pg. 266. Died March 28, 1917, left a widower Jerome B. Ford and two daughters: Melissa M. Yale of Bristol and Annie B. Yale of Patchogue, LI, New York. Published in the Bristol Press as of 10 April, 1917. Bond, 10, April, 1917 Vol. 36, Pg. 185. $300.00 Melisa M. Yale and Alfred J. Yale. Inventory, Accept 8 May, 1917, Vol. 40, pg. 445. Return of Claims, 17th Oct, 1917 by Melissa M. Yale, Executrix. Administration of Account, 17, Oct. 1917, accepted. Source: Probate File of Mary J. Ford, March 28, 1917 #2850, Archives of the Connecticut State Library. 1. I direct that all my just debts, funeral and probate expenses be paid, but moneys other than those in the Farmington Savings Bank shall be used for such payments, if there are sufficient such moneys. 2. I give, devise and bequeath to my husband, Jerome B. Ford, the shop, water-power and land, including about one half acre, lying easterly of the highway known as Jerome Avenue; and also all tools, machinery and stock contained in said shop, and all accounts of other property belonging to the business carried on in said shop. I also give and devise to my said husband the use, occupancy and income of my homestead, including the house in which we now live, and about fifteen acres of land on the westerly side of Jerome Avenue; and of the household goods in said house. 3. I give and bequeath to my daughter, Annie Barclay Yale, of Patchogue City, Long Island, wife of Henry A. Yale, all the money which may be left, at the time of my death, in the Farmington Savings Bank. 4. I give and bequeath to my daughter, Melissa M. Yale, of Bristol, wife of Frank E. Yale, any money, on hand or deposited in bank, except that in the Farmington Savings Bank, after payment of expenses and debts as above provided. And I also bequeath to said Melissa M. Yale, after the death of my said husband, the homestead, land and furniture, to be to her and to her heirs forever. 5. I hereby nominate and appoint said Melissa M. Yale to be executor hereof, without bonds. In witness whereof, I have hereunto set [my] hand and seal, at said Bristol, this eighteenth day of July, 1904. 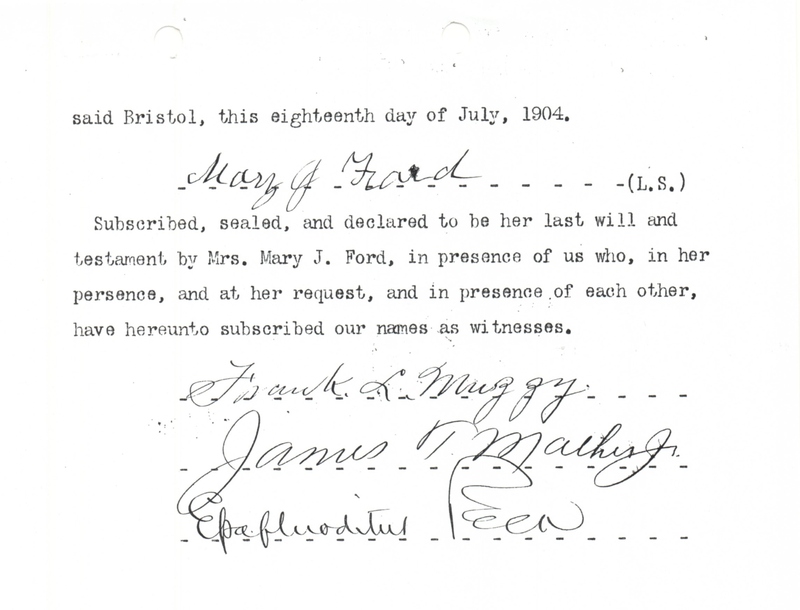 Signed Mary J. Ford (IL) Subscribed, sealed, and declared to be her last will and testament by Mrs. Mary J. Ford, in presence of us who, in her presence, and at her request, and in presence of each other, have hereunto subscribed our names as witnesses. [Frank L. Muggy, James T. Mather Jr. Epaphrodius Peck]. This is a very interesting will in that she makes sure all the possessions and property are left to her husband Jerome. I am also curious about what Melissa did with all the land before she left for California to be with her son? This is what I know about Mary Jane Barclay Ford, sister and heir of Alexander Barclay. Of course there is always more research to be done but it is time to move on.